Your partner in providing customized, motivational programming for your special events, retreats, and professional development. Motivational speaker Kathryn Beisner lives by the motto, "No Guts, No Story!" 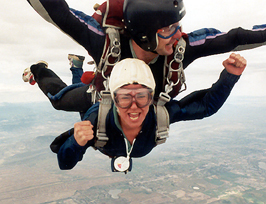 as she skydives to celebrate her birthday! At KBS Productions we are committed to contributing to the success of your event long before our speaker steps up to the podium. From the moment of your first call to KBS Productions, you will experience a level of customer service that is a welcome treat. You will receive a friendly and interested greeting from Cyn Hales, our bookings coordinator. With her broad experience in project management, she understands the challenges you face to produce a special event. Our presenter, Kathryn Beisner, will meet or conference with you about your event and programming goals so she may tailor her presentation to your audience and objectives, providing you with a program that is always fresh, never canned. When you choose KBS Productions, you choose quality from start to finish. We look forward to working with you!